Autumn is a great and beautiful time of year. The landscapes turn shades of orange, echoing the warmth that the season brings before winter sets in. Autumn turns leaves into orange and brown and this iconic image has been used in many art forms and visuals to portray the changing seasons. You can also convey autumn in your presentation using the following Autumn Leaves PowerPoint Templates that each have beautiful warm autumn-themes. You can take with you a beautiful memory of spring by collecting flowers, leaves, and little twigs and pressing them between pages of thick books. This has been a long tradition many people do to preserve memories from nature and put them in their crafts, artwork, or scrapbooks. 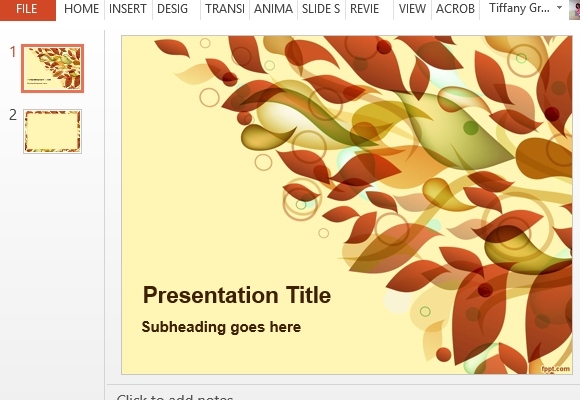 You can also do the same with your presentation with the help of this Pressed Leaves PowerPoint Template. This template features a natural, parchment-like paper background, with realistic-looking, dark brown pressed leaves for accent. The template features five pre-made slides that each have different layouts to give you plenty of variety and options to present your information. You can add more slide layouts depending on your presentation needs by clicking on New Slide from the Home Menu. For a more classic yet modern look that channels the colors of autumn to your presentations, you can have this Sepia Autumn Leaves PowerPoint Template as your go-to template. This template evokes movement and dynamism with its design as different-shaped leaves scatter across the slides. They also showcase the different colors of autumn in red, orange, and some green over a warm, light orange background. It also features different slide layouts to conveniently provide you variety in presenting your content. 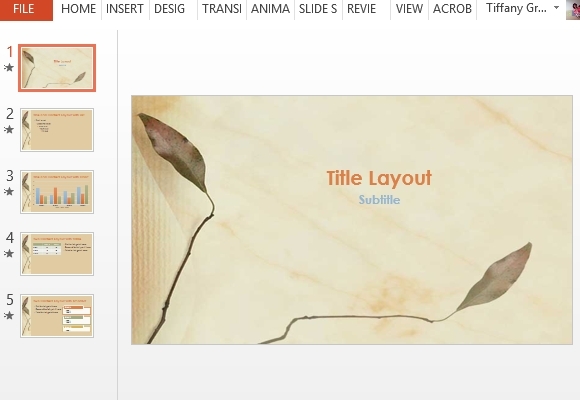 The template can be used in any PowerPoint 2007 and 2010 presentations if you’re looking for a template with an orange autumn theme or a nature-inspired background. With the right lighting, nature can often appear golden during autumn season. The leaves turn yellow and they reflect the sunlight in a beautiful way that makes even the most common places look breathtaking. 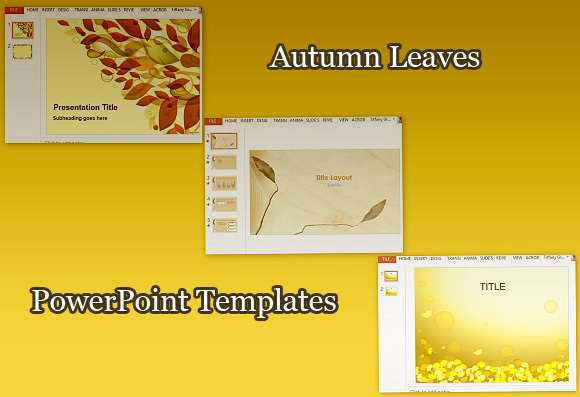 To showcase the golden autumn in your own nature-inspired presentation, you can use this Golden Autumn PowerPoint Template which shows different shades of autumn leaves serving as a border on the slides. 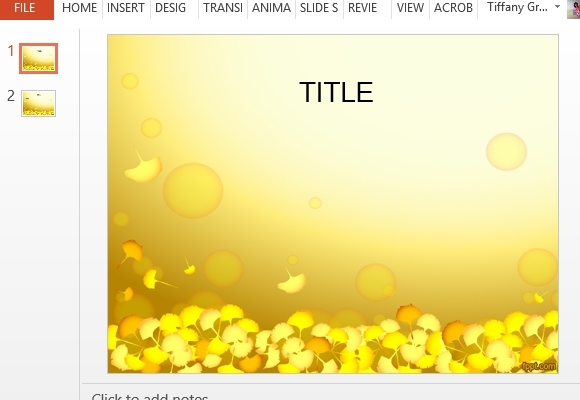 The background is in a golden gradient design that draws the eyes straight to your content. It also features coordinating slides that have different layouts to suit your presentation needs. This template can be used for business, organizations, school, or for personal slideshow projects, just like the other templates.